John Thomas on horseback above and he and his wife Uranie Miller in above photos. Long ago and far away a 16-year-old boy named Isaac Bonsall was orphaned. Isaac Bonsall, son of Jacob and Hannah Egler Bonsall, of Pennsylvania, was orphaned when his father was murdered. His mother had died earlier. Isaac stayed there in his hometown for three more years after his father was murdered and then traveled south to Mississippi, where he lived during the next three years. Not being able to foresee the future, Isaac Bonsall got on a U.S. ship, carrying troops from New Orleans to Galveston, Texas, when the ship was wrecked. miles through the marshes and bayous until they reached a wooded section covered with large oak trees. Although these refugees did not know it, they had stumbled onto Grand Chenier. a prominent Cameron Parish Pioneer. 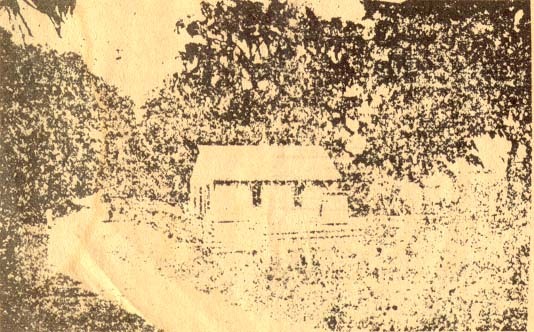 Isaac’s son, John Thomas Bonsall lived with his widowed mother, Mary Elizabeth Sweeney Bonsall in Grand Chenier. Her father, John Wm. Sweeney is said to have helped the grandsons build a two-wheeled cart, which they used on the farm and also in traveling around Grand Chenier. When John ThomasBonsall grew up, he fell in love with and married Uranie Miller, daughter of Michel Miller Jr and Mary Elena Broussard. The young couple moved into the Michel Miller home where they lived out their lives with their 14 children. Among these children was, Dr Isaac Bonsall. John Thomas Bonsall was called “Grandpa Tom” by all his family and close friends. In addition to owning and working a large farm, Bonsall also served as a Cameron Parish Police Juror for eight years and as a School Board Member for 20 years. He was also a major factor in getting a schoolhouse built on his farm, which had a record of 30 pupils in five grades. On his farm, on the highest part of Grand Chenier ridge, John Thomas Bonsall raised beans, peas, melons, pumpkins, potatoes, squash and other food products. He also had orange orchards from which oranges were sent to Galveston to be sold. However in 1915 this good money making crop of oranges was nipped in the bud, when almost 90% of the orange trees in Cameron Parish froze. The growers were never able to satisfactorily rebuild their orange orchards. Next Bonsall planted pecan trees, which brought a satisfactory income. He grew sugar cane, mostly for the family’s syrup, which he made in his own syrup mill. John Thomas Bonsall sold the surplus syrup as a money crop. The process of making cane syrup was described as follows. “The sugar canes are cut near the ground by men with long knives, then the stalks are stripped of their leaves, loaded onto wagons, and taken to the family mill, where the stalks are fed into a series of steel rollers, forcing the juice out. This juice is then transferred to the boiler to cook. Every year Grandpa Tom Bonsall stored many gallons of syrup for home use, and then the excess was sold." In about 1909, several rich rice farmers built a levee inthe Mermentau River between Crain Brothers and the new Mermentau Bridge,to keep the salt water out oftheir rice crops. The down side of this levee was that it caused the cattle farms and small crop farmer’s land to flood. Legend says that one darknight a group of cattlemen and small crop farmers, who called themselves The Regulators, got together, and went to the dam. There they threatened the levee guard and he left. They then blew up the levee. No one was ever charged with the dynamiting. Like the cattlemen around him, Bonsall’s cattle were taken to Isle Aux Vache, Isle Aux Tigre, Isle Chine Vert or Isle Latanier during the winter months. In 1935, John Thomas Bonsall who was a prominent pioneer, died at age 85 at his residence at Cow Island. He had served in the Civil War as a Confederate Veteran, in the home guard stationed at the mouth of the Calcasieu River. His sons surviving him were Dr. Isaac Bonsall, Dennis, Nelson, and Delis; plus four daughters, Mrs. Severin Miller, Mrs. Florence Theriot, Mrs. Adolph Dupuis, and Miss Maggie Bonsall. Healso had 45 grandchildren and 37 great-grandchildren. A granddaughter Mary Alice Bonsall and her husband, Horace P. Mhire, purchased the old John Thomas Bonsall home. The lower floor of this home has been extensively remodeled, but the second floor has remained much the same as when built. The story of the Bonsall family began in Cameron Parish in about 1846, when Isaac Bonsall was shipwrecked in the Gulf of Mexico south of Grand Chenier and stumbled his way to the home of John William Sweeney. It was here that he met, fell in love with, and married John Wm. Sweeney’s daughter, Mary Elizabeth Sweeney. They had six children, all ofwhom were prominent in Cameron Parish history. Among these six children were John Thomas and Isaac Bonsall, II. Isaac Bonsall, II was born in 1852 and married Amanda Holmes Kelley, daughter of Elmira Kelley. We do not know the name of Elmira Kelley’s husband, who apparently died early, since Elmira lived with her daughter, Amanda Kelley and Isaac Bonsall, from the time oftheir marriage in about 1868, until her death. The best description of the life and times of Dr. Isaac Bonsall is told by his granddaughter, the late Rae Chadwell. She wrote: “Dr. Isaac Bonsall moved into a large home in the Cameron square, when I was a child. This home may have come from his wife, Amanda Kelley’s family. “There was a school house just back of the Cameron Court House, about a square from Dr. Isaac’s home,” says Rae Chadwell, “and we - the young uncles, aunts, and cousins who lived nearby -went to that school. We usually had lunch with my grandparents, Isaac and Amanda Bonsall. There was always a lot of hustle and bustle around downtown Cameron in those days, especially when the schooner ‘Romero’ and later the paddle wheeler, ‘Rex’, came from Lake Charles bringing mail. “My grandparents’ home was large, 15 or 16 rooms with galleries across the front of the upper and lower floors. A wide center hall ran the length of the house and with one step down led to along dining room, which also served as a makeshift greenhouse for grandma’s plants filling the back windows and hung from walls and ceiling. On each side of the center hall were two large rooms, called the east and west parlors which become a community living area where the family so often gathered. “A path from the large house led to a little cottage and the front room of this cottage was used by grandfather Isaac Bonsall, as his office.The back room was a generally forbidden room, known as Grandpa’s study where his medicine cabinet, his medical books, medical journals, and his doctor’s bag were kept. “There were large oaks and some Osage orange trees all around the house and on the fences. Under the front oaks were grandma’s guine a fowl which streamed back and forth, single file, crying ‘pot-rack, pot-rack’ the whole day through. Once she had a peacock and a pea hen. Dr. Isaac tilled his land himself, tended to the live stock and harvested his crops, while his wife, Amanda, managed the large house and it’s works. He made periodic trips to Galveston, Texas, on a schooner bringing supplies for his farm and household and medical needs. ride over impossible bad roads, and through marshes, to attend the sick. Dr. Isaac Bonsall, Jr died in 1922 in Cameron and his widow, Amanda Holmes Kelley, died in 1933. They are buried side by side in the Henry Cemetery, in the Cameron Square. Another son of John Thomas and Uranie Bonsall was Desire Nelson Bonsall, who was born in Grand Chenier and who married Lonnie Theriot. Lonnie was the daughter of Pierre Telsmar Theriot and Artemise Richard. They had seven children, Pierre Telsmar, Elton Adam, twins, Claude and Claudie, John Irvin, Viola, and Ual Bonsall. Nelson Bonsall was a carpenter and farmer. He also helped build many schools in Cameron Parish and was also a member of the Farm Bureau for many years. His wife, Lonnie, died in 1967and Nelson Bonsall died in 1970. They are buried side by side in the St. Eugene Cemetery in Grand Chenier. Telsmar Bonsall, son of Nelson Bonsall was involved in community affairs and was Cameron Citizen of the year.He helped build South Cameron Hospital with Dyson Lumber Co., and he stayed on to work and retireat the hospital. At that time the maintance men took care of the hospital, kept all the grounds clean, kept up withthe ambulance men and helped the nurses when needed. Another son of John Thomas was Dennis Bonsall who served three years in the Coast Guard during World War II, then became a Cameron School Board memberfor 26 years. The late Joe Bonsall of Vinton was well known for his accordion music and his music is still broadcast on the French Channel. Henry James “Jim” Bonsall was a well-known mail carrier in the eastern end of Grand Chenier. He worked when mail was hauled by horses. Later, Jim opened a store just south of the Grand Chenier Park. He became known as the first person in Cameron Parish who had a president stay with him - thought to have been Franklin Delano Roosevelt - who came to Grand Chenier on a hunting trip in the early 1930s prior to becoming President. Henry J. Bonsall died in1932 and his wife Zelma Montie, died in 1906. They are both buried in the McCall Cemetery in Grand Chenier. There are not many families that still carry the name of Bonsall family in Cameron Parish, but there are a large number of extended families still living there. But the Bonsalls played an important part in early day Cameron.